Category: Freeware : Online Antivirus Active Scan. 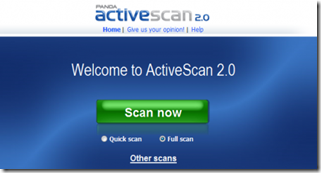 Panda ActiveScan is a powerful online antivirus Scanner that scans your computer online for viruses, free of charge, with just a simple click from your browser. Start Scan and Check your PC for Virus and remove them also. The Scan is excellent if your system is already infected with Virus and your AV is not able to remove them as the PC is already infected and currupt? Use Panda online Scanner to remove Virus and clean your PC from Virus and Trojans / Malware with the online anti Virus Scan.